Zak Simmonds-Hurn Illustration: Sword Swingin'! Here's a new drawing of my character Daigo, scrapping like usual! I've been reading a bit of BERSERK! lately, if you can stomach it it's pretty incredible stuff, Miura is an absolute monster draughtsman and storyteller and he reminds you of this fact in every single panel. 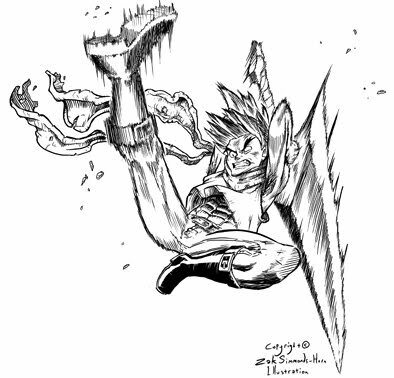 This drawing is partly a result of reading lots of his action scenes: motion-blur lines ahoy! At some point soon I'll be posting bits and pieces over at the KING ZILLA blog too, be sure to give it a look, there's some lovely work there. Cheers to Sinistar for the invite! That's some kinetic inking there dude, brilliant sense of movement! The wait between Berserk chapters can be as brutal as the comics sometimes but at least I can say I'm always up to date lol. You should check out Aiki or the Gatnz mangas out if you haven't already, just for the fight scenes alone. Zak dude this is awesome!